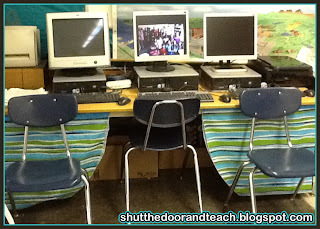 Shut the Door and Teach: Got $12? 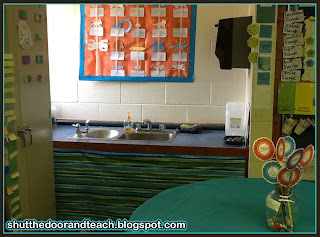 How About a Classroom Makeover! I can't believe some teachers are soon to be finished for the year! Here in Massachusetts (well, this city, anyway), thanks to Nemo the kids don't get out until June 26. Feels like FOREVER. Although now that the state testing pressures are off, I can refocus my energies on poor, neglected little Social Studies and Science, woohoo! The round table got a round tablecloth of course, and I put some double sided tape in 8 spots around the circumference. It seems to be staying in place very well. Behind that I took a rectangular tablecloth, folded it in half, and put Duck Tape on the fold at the top. This gave it some durability when I hole punched it. I got the tiniest size of those 3M hooks for the edge (I think I used 4 in total). This way I can easily remove when needed. For my shelves near my desk, it's hard to envision the full effect all the way across (with my desk there in the middle), but I did a solid blue in the center, and then the striped panels on the ends. For those I accidentally got round tablecloths! D'oh! So I cut each one in half, folded it, and again, Duck Taped the top where I'd cut for durability. The little hooks make it easy to get to the books underneath. For the kids' shelves I decided to leave half of it open so they could find things more easily. 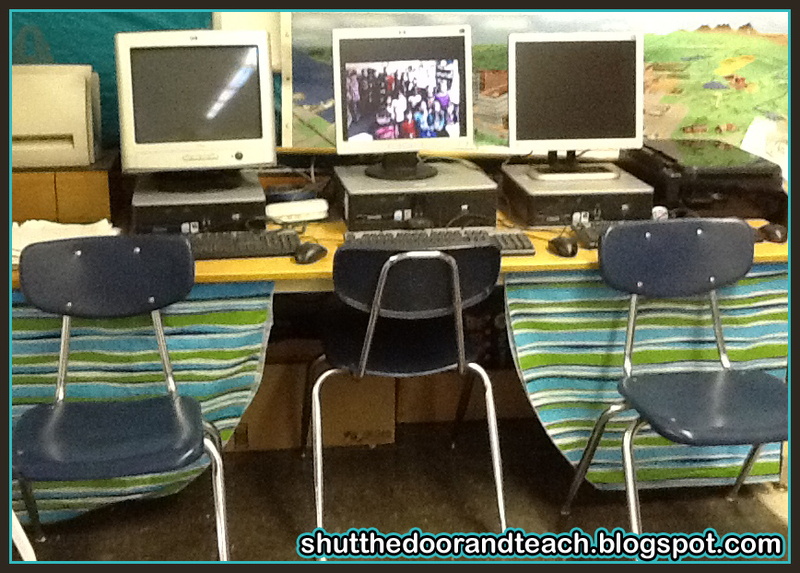 For indoor recess I told them to remove the panels so they don't rip. I also used those little plastic hole-punch reinforcements applicators for even more durability. I had 2 panels left, so I put them over at the computer table. We only ever use the middle computer anyway; the others each have their own little "quirk" that makes them undesirable. Finally, not really an upgrade in decor, other than to keep my "dotted table" a lot more organized, was the Morning Meeting Kit. Previously all those things were spread out on the table and it looked messy. 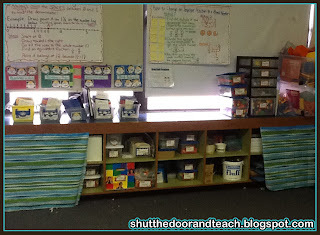 Now we have the Shares Sign Up board, a whiteboard with marker and eraser, character education information, and a ball for games. I LOVE it, and I don't know why I didn't think of this earlier! This vertical storage works so much better than the tub I put there first. 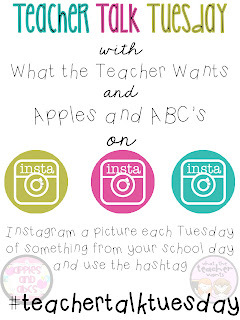 If you have never used Instagram before (like me 3 weeks ago) you need to download the app for your iThing or Android device. 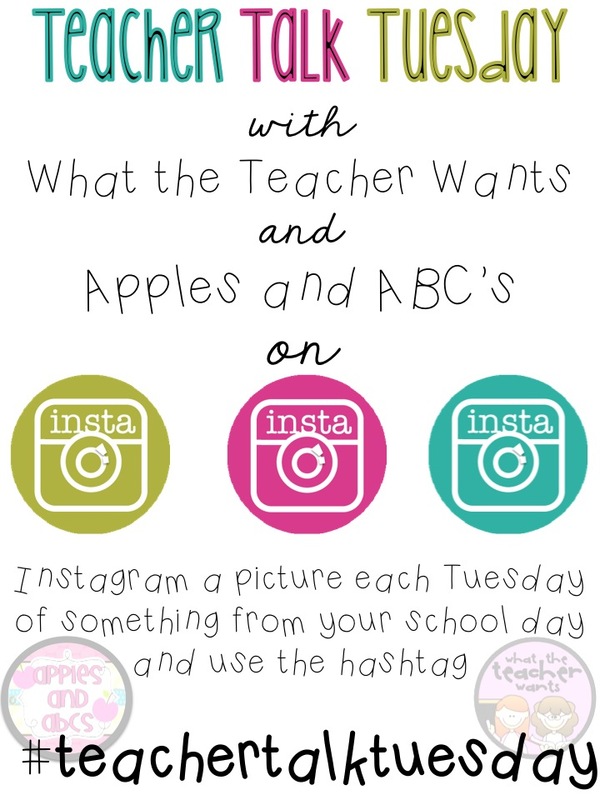 From there you can set up an account, take some pictures, edit them, and post them on Instagram (it's often likened to Facebook in that it's all about sharing and followers and what-have-you). Now I know what you're thinking. Why bother? 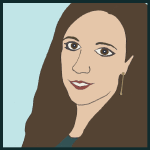 Thank you for coming by my blog so that I could find yours! 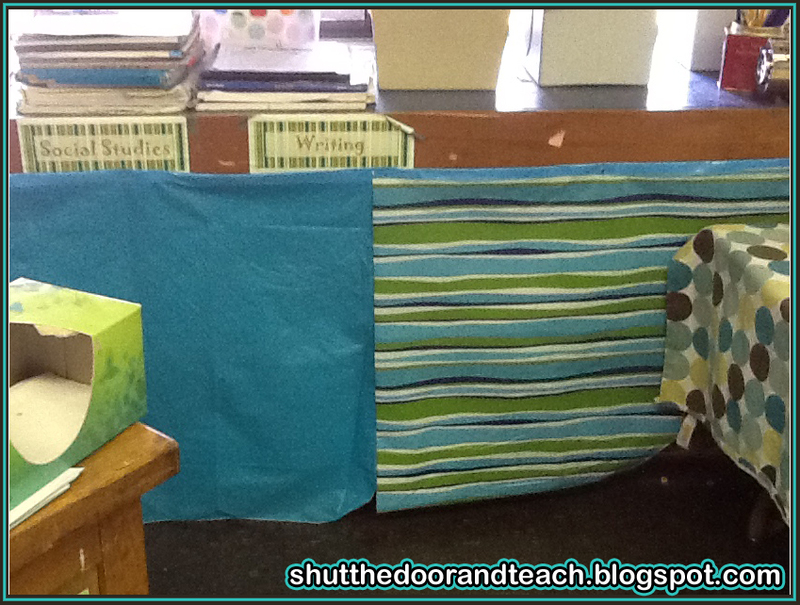 I love what you did with the tablecloths- it looks great!! Looks great! I'm a new reader... I will be a first year teacher next fall with my 1st classroom! 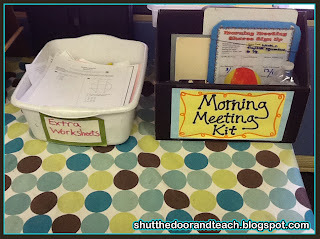 Just currious, what is in your "morning meeting kit"? Great question, Kimberly! 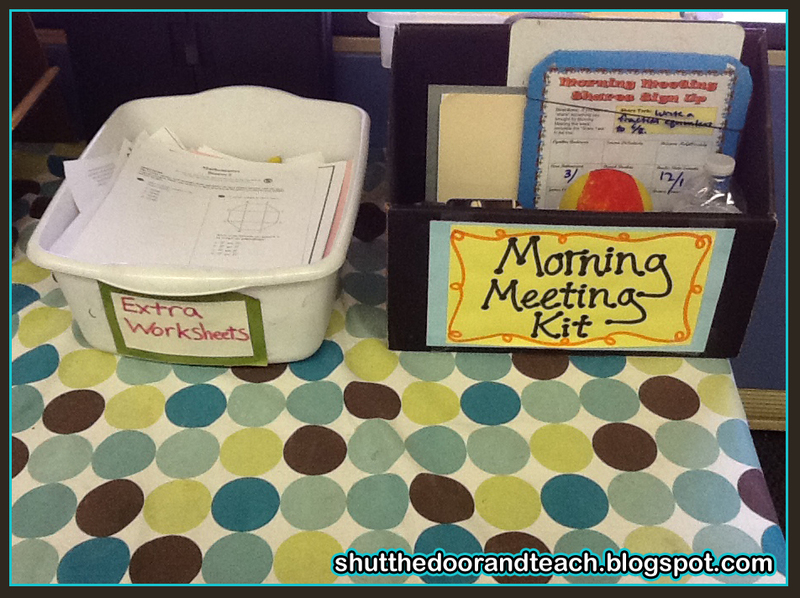 I decided to blog about my Morning Meeting Kit this week thanks to you. :) I spread out the contents, photographed it, and described the contents. I hope it's helpful for you, and I wish you luck with your first year!